Frets:21 Silver Nickel Frets;. Fingerboard Abalone Dots Inlay. There is Rosewood back inlaid;. Maple Fingerboard;. Side Dots:Black. Heel Width:56.5mm;. Heel Depth:24.2mm;. We believe we try our best to resolve the issues. Material: Maple. This is after-market guitar neck, but not original one. 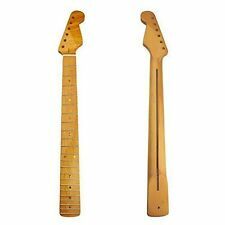 1 x Guitar Neck. - Application for TL guitar. We will solve your problem as soon as possible. Your support for us always. Pre Slotted Bone Fender Nut for 7.25" radius Note: the high E string slot isn't deep enough and needs to be filed to hold the string. 2006 60th Anniversary MIM Fender Stratocaster Standard maple strat neck in good condition. Minimal fret wear. Neck is straight, truss rod works.Includes tuners, neck plate with screws. 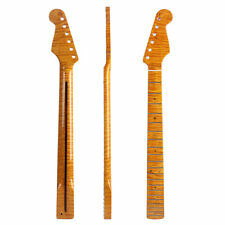 Neck Maple, Modern “C” Shape. 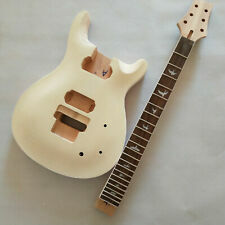 1 set DIY unfinished Guitar Neck and body for PRS style guitar kit rosewood fingerboard.real Pearl bird inlay. weight :2.75kg. 1994 Ibanez RG450 Maple Neck Wizard II Dot Inlays Locking Nut MIK. Condition is Used. Shipped with USPS Priority Mail. Our factory can custom make you need. scale length 25.5" String pillow: 42 mm. Connection width: 56 -57mm.tuner holes： 10 mm. Truss Rod Style & Location. GUITAR NECK DETAILS 25.5" Standard Fender. Neck Shaft Wood. Heel Width. Dual Acting Adjust @ Heel. Tuner Hole Size. Drill 4 Neck Mounting Holes - FREE. Fingerboard Material: Rosewood. Tuner holes: 13.8mm, fit for die cast machine heads. Neck Material: Maple. Heel size: Width: 63.5-64mm. Scale length: 864mm(34"). Maple Fingerboard: dot black inlay. Heel : 63-64 mm.scale length 34". Our factory can custom make you need. String pillow: 42 mm. Connection width: 56 -57mm.tuner holes： 10 mm. Guitar neck adopts natural maple fingerboard selects premium rosewood with 21 frets, smooth and with high density. 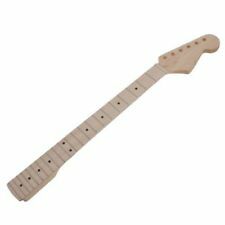 1 x Maple 21 Fret Electric Guitar Neck For Fender ST Guitar. Smooth and high stability. This piece has a light coat of walnut oil applied to seal the wood and accentuate the grain. Custom T-Style Guitar Neck. The frets on our necks are not leveled before sale. The fretboard is carefully manufactured to have a straight and even radius but fret leveling and crowning may be necessary for a low action setup. This piece has a light coat of walnut oil applied to seal the wood and accentuate the grain. 24.75" Scale S-Style Guitar Neck. The frets on our necks are not leveled before sale. The fretboard is carefully manufactured to have a straight and even radius but fret leveling and crowning may be necessary for a low action setup. Kmise Soprano Ukulele Concert Tenor Ukelele Mahogany with Gig Bag Tuner Strap. Ukulele parts. Banjo Accessories. Chromatic Clip-On Digital Tuner for Acoustic Guitar Bass Violin Ukulele. Piano Parts Accessory. Ukulele Soprano Concert Tenor Ukelele Mahogany with Gig Bag Tuner Strap Kmise. Ukulele parts. Aklot Electric Ukulele Solid Mahogany Tenor Soprano Concert Uke with EQ. Banjo Parts. Digital Chromatic Electric Guitar Tuner for Acoustic Bass Violin Ukulele Parts. 1pc New Maple 22 Fret Guitar Neck For s tyle ST Stratocaster Guitar Repair parts gloss. The hole: 10mm. heel width 55.5-56.5mm. heel height 27mm. Ukulele Soprano Concert Tenor Ukelele Mahogany with Gig Bag Tuner Strap Kmise. Kmise Guitar Neck Canada Maple 22 Frets Bolt On. Kmise Guitar Neck Canada Maple 22 Fret Bolt On. Kmise Electric Guitar Neck Canada Maple 22 Bolt On. Thin lacquer sealer coating. Never been used - frets level and smooth - ready to play condition!99 cents NO RESERVE. Fast and smooth aged oil finish. Never been used - ready to play condition!99 cents NO RESERVE. Ukulele parts. Banjo parts. Bamboo flute. Guitar Bass Accessories. Material: Mahogany. Guitar One Humbucker Pickguard Scratch Plate For Fender Stratocaster Strat 3 Ply. 1pc Guitar Body Blank Scratch Plate Pickguard Material Sheet 3 Ply 43X29cm. Truss Rod Adjust: At Bottom. With Rosewood back inlaid. Heel Width: 56mm. Frets: 21 Silver Nickel Frets. We are here to help you. Tuning Holes: 10mm. Used Strat style neck with tuners. Has signs of wear and sanding. Seems like it used to have a locking nut, now it's been replaced with a custom nut. Was told by the previous owner that its a mij neck. Smooth thin lacquer sealer coating. Never been used - frets level and smooth - ready to play condition!99 cents NO RESERVE. Maple fretboard finish. Standard 251/2 "annoyance scale and heel width 56 mm right fender. Used to repair the use of normal. Fingerboard radius: 10 (254MM). Made In USA Warmoth S tratocaster Birdseye Maple Guitar Neck. Ebony Fretboard. Floyd Ready. 6100 Frets. Fret Size - 6100. 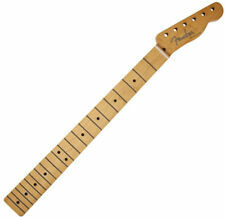 Neck Condition:Frets are in excellent condition overall with light signs of playwear. Neck has a 1-11/16" nut width, 2-3/16" heel width rounded strat style. Never been used - ready to play condition!99 cents NO RESERVE. Maple wood neck and fretboard. Material: Maple. A black line on the guitar neck back for instructing the installation of truss rod. Only for right-handed version guitar. 1 Guitar Neck (Right-Handed). Neck has a 1-11/16" nut width, 2-3/16" heel width. Never been used - ready to play condition!99 cents NO RESERVE. The neck is made of high quality imported Canadian maple. Neck wood: Maple. 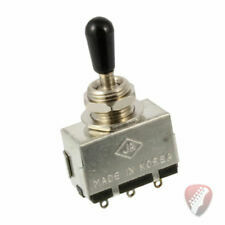 Designed for electric guitar. Guitar neck total length: Approx. 67cm / 26.4in. 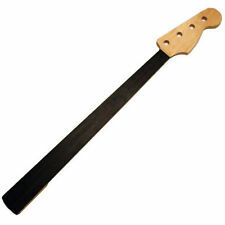 Guitar neck weight: 555g / 19.5oz. 1 Guitar Neck. Connection width :63-64 mm. The hole: 18 mm. String pillow 38mm. Collected from a guitar manufacture, with predrilled tuner screw holes and string retainer holes. - 56mm heel width. - 24 Nickel/Silver frets, standard 6105 size. - standard C shape back profile. Electric Guitar neck for bc /25.5"
The difficulty of making an electric guitar is very large. Blaming my electric guitar body design is not reasonable. 1: All guitar accessories belong to diy, requiring you to have very good hands-on skills.